Yes, the brand new television season has started and I’m happy to participate in another KRO-NCRV transmedia drama. 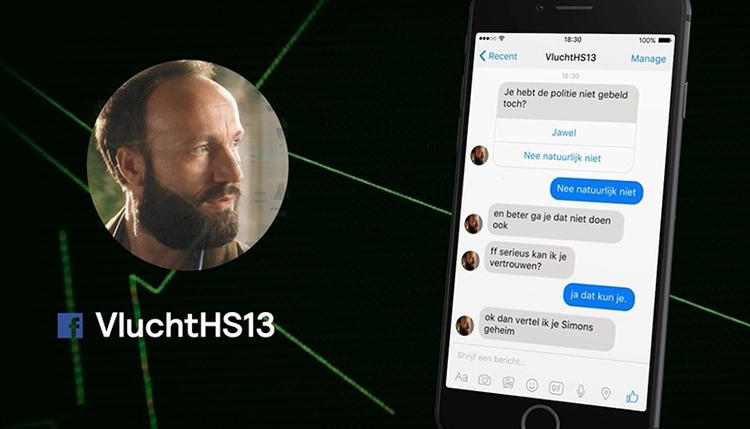 Flight HS13 (originally Vlucht HS13) is not just a thrilling television series, it has an interactive twist. In the first double episode of this thriller series we meet Liv, who’s life falls apart when she hears the plane with her husband Simon crashed. But then she discovers that he was not on the plane. Nobody understands what is going on. Where is Simon? Simon’s cousin Kevin seems to know more than what he is sharing and it’s up to the viewer to try to make him talk. How? By chatting with him on Facebook Messenger. If you earn his trust, the dubious man will send you messages, photos, audio and video, that will bring you a step closer to the truth. It is an entertaining gimmick, but is it really that innovative? Honestly it made me think about the good old MSN-era, when I (and 250.000 other Dutchies) befriended chatbot Alice. And that was 10 years ago! But yeah, now that Facebook has (finally) released the Messenger API, this chat is indeed useful for storytelling purposes. Clever, because it is very accessible. You don’t have to download any apps, a like on Facebook will do (and that’s not ever necessary). And it’s pretty successful, the series character has scraped over 50.000 likes in the first week.